Kay M. Thomas, 54, of West Bend, passed away on Friday, April 6, 2018, at her home. Kay was born on December 7, 1963, in Washburn, Wisconsin, the daughter of the late Theodore and Irene (Valle) Thomas. Kay attended the West Bend Schools. She worked various jobs within the community including Kohl’s Department Store, Country Inn and Suites and TTI Industries. 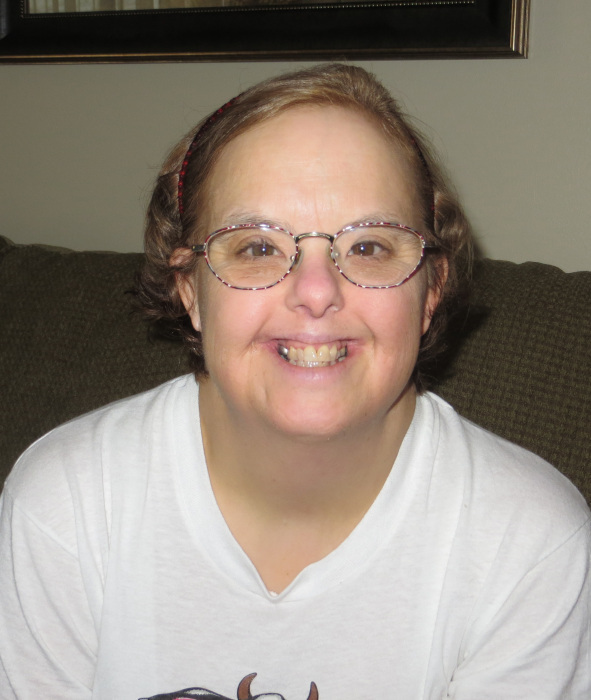 She enjoyed bowling, swimming, and the Green Bay Packers. She was an accomplished Special Olympian. Those Kay leaves behind to cherish her memory include six siblings, Michael (Jerolyn) Thomas, Paul (Gloria) Thomas, Jenny (Richard) Smith, Kevin (Patti) Thomas, Kelly (Eugene) Sanchez, Tim (Amy) Thomas; 22 nieces, nephews, great nieces and nephew, special roommates Larry, Red & Bea, and other relatives and friends. In addition to her parents, Kay was preceded in death by a brother, Patrick Thomas. Kay’s family will greet relatives and friends at St. Frances Cabrini Catholic Church, 1025 S. 7th Avenue, in West Bend, on Friday, April 13, 2018, from 11:00 a.m. until 1:00 p.m. Mass will follow with Rev. Jerome Repenshek officiating and burial will take place at Washington County Memorial Park in West Bend. When Kay hugged you, you knew you were hugged. Kay danced when Kay wanted to dance, and she usually outlasted everyone. She lit up the room when family and friends gathered. As our family grew her pride grew with each new title….Sister-in-law, Aunt, Great Aunt, Godparent. Holidays were extra special for Kay. No one in our family got more excited for Christmas, Easter, weddings, christenings and birthdays. Kay never held grudges. She never, ever stayed mad at you. If you leaned on Kay as a friend or for a favor she did it without question and she did it with unconditional love and pride. Kay was our family's most decorated athlete, with numerous medals in bowling, gymnastics, swimming, and track & field. She loved ice cream and she really, really loved 3 Musketeers bar. The only time you stayed out of Kay’s way was when Mary-Kate and Ashley Olsen were on TV. That is what made Kay different. The family would like to extend a special thank you to The Threshold for creating so many opportunities for Kay throughout the years. A very special thank you goes out to Judy Grover & family for sharing their home & love with Kay for 20+ years. No words can express our heartfelt gratitude for the care, support, and advocacy that the staff of PeopleServe provided Kay. You are all angels! Lastly, thank you to Seasons Hospice for the compassionate care given to Kay during her final days. In lieu of flowers, the family would appreciate memorials to The Threshold, Inc. The Myrhum Patten Miller & Kietzer Funeral Home has been entrusted with Kay’s arrangements. Additional information and guest book may be found at www.myrhum-patten.com.